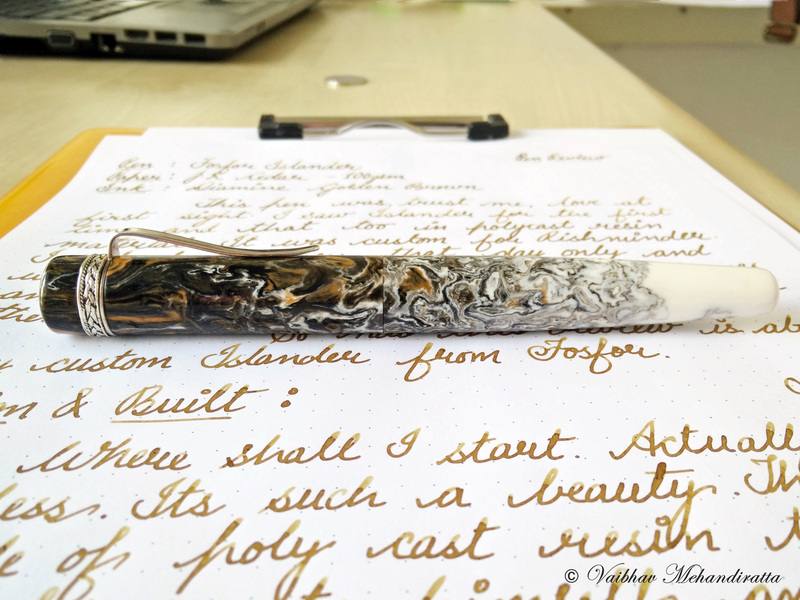 Well this particular pen, ISLANDER from Fosfor Pens was love at first site when I actually saw it in person at Delhi Pen Meet. I had seen lot of Islanders in the Wood online but never saw one in polycast resin. And Rishminder was the guy at pen meet who had the pen made out of polycast resin in tri colors of Indian Flag and i must complement Manoj Deshmukh of the wonderfully executed job. And trust me friends, it was love at first sight. I ordered the pen that very day and waited patiently for 3 weeks while going through the process of selecting colors, clips and bands. It was an amazing experience dealing with him and thus it lead me to ordering few more pens from him. Where shall i start ? Actually i was speechless when I first saw the pen. It’s such a beauty. It arrived in very nice cardboard package which actually is a nice case for this big pen. The pen box is the only area where the branding is done. and you won’t find the branding anywhere else. 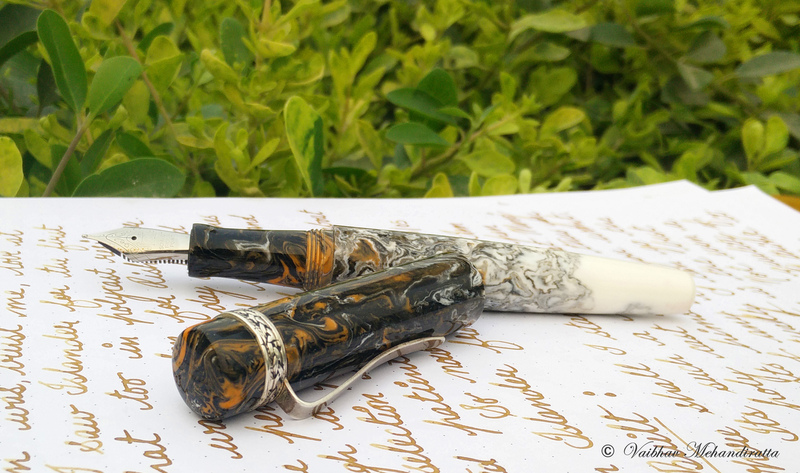 The pen is made of polycast acrylic resin which Manoj Deshmukh of Fosfor pen casts himself and thus you have the flexibility of having the pen in any color mix you want. And I actually wanted something brownish orange with white as a base and Manoj has produced a beauty. And as far as finish is concerned, I can find not even a single fault. It’s supremely well finished not even a single lathe mark. 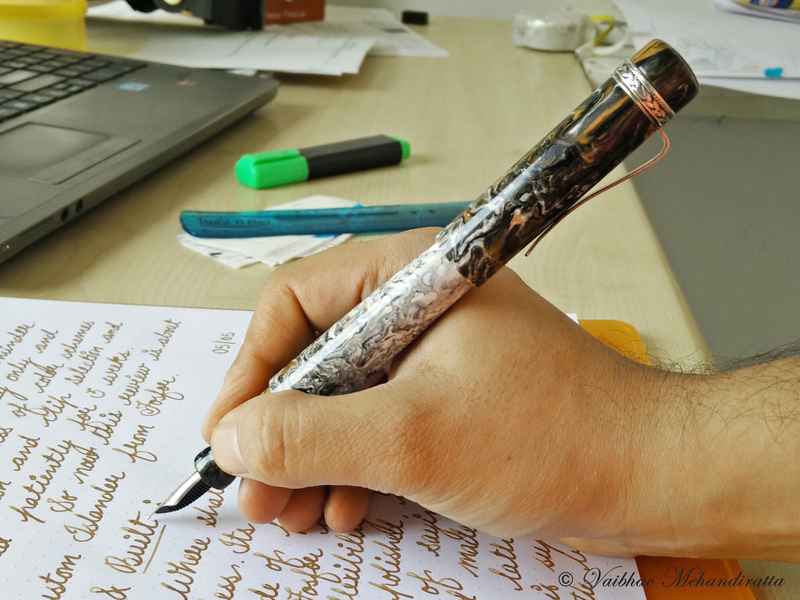 I can even go to an extent of saying that the pen is the best finished pen of India. The quality of the resin is superb though I beleive that being acrylic it is brittle. So care is needed in that regards. Its an eye-candy for sure. As far as design is concerned it’s a beautifully designed and executed pen. It’s a straight cylindrical pen with barrel tapering at bottom. The cap top and barrel bottom have soft rounded edges. Below are the few images which might help in design understanding. The cap top and barrel bottom have sublime protrusion i.e. they are raised. Clip is springy and stiff and like the fact the bottom is raised for easy clipping. The band above the clip is above has intricate design and is made of pure Silver. 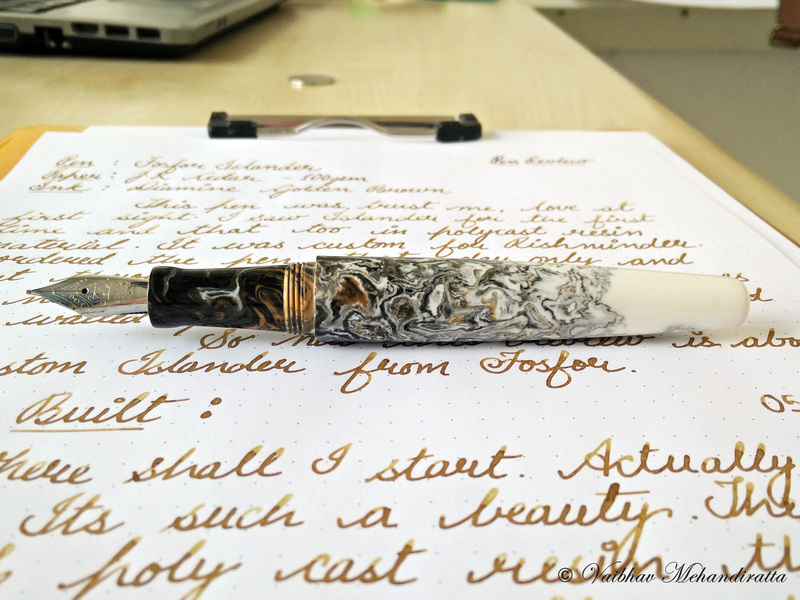 I love this pen and soooo beautiful. And this has taken place in my top 5 pens with steel nibs. It’s a perfectly balanced pen when writing uncapped and unposted. But for me it becomes quite large and uncomfortable when cap is posted at back. Yes the cap posts quite securely. 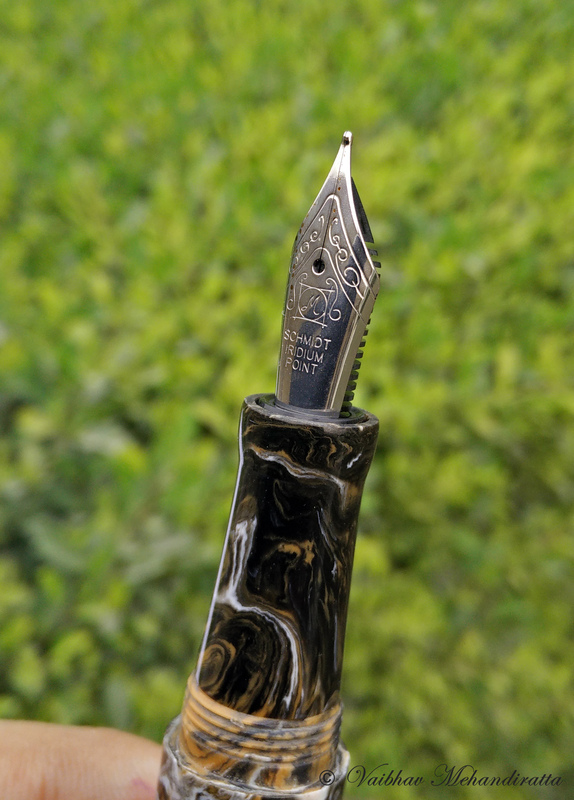 The pen length is 149 mm when capped and 133 when uncapped. 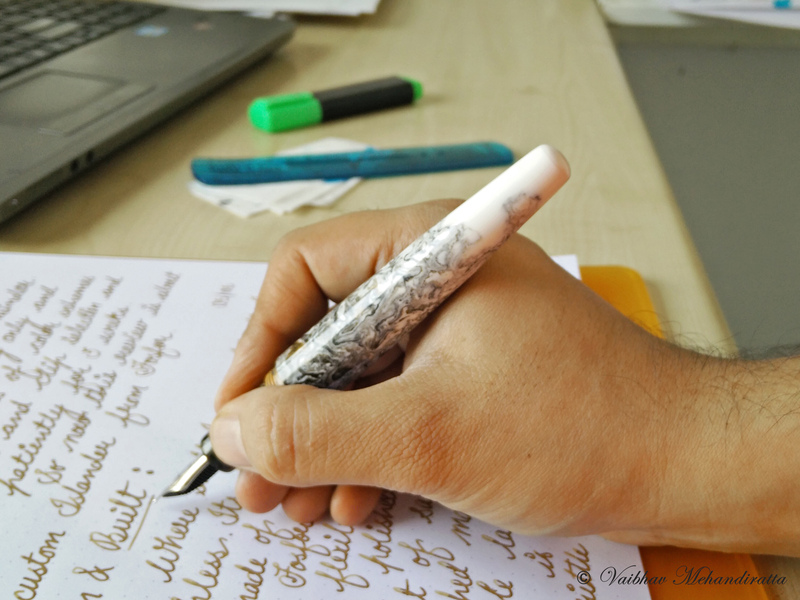 Below are the images of the pen showing comparative of writing with cap posted and unposted. Since its a long pen I don’t think there is no need of posting cap. 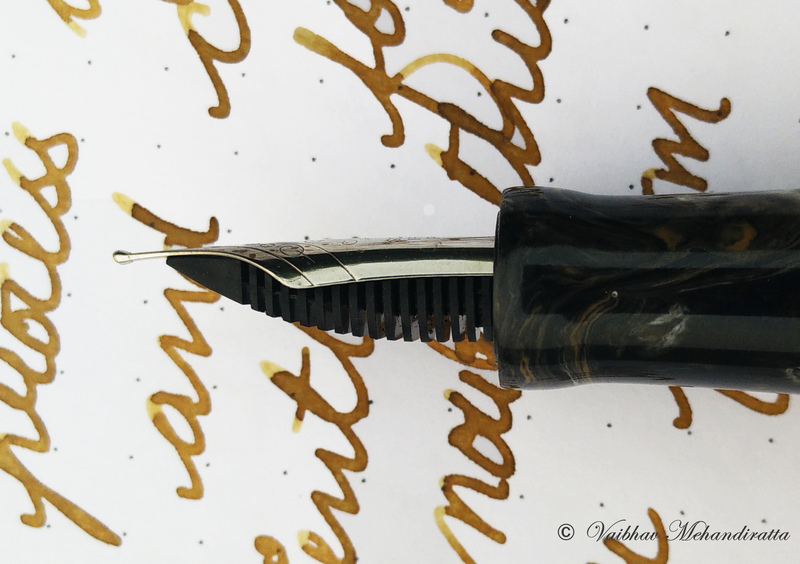 There were lot of nib options like JoWo, Schmidt and Ambitious and I opted for Schmidt silver monotone #6 Medium nib which is tried and tested. The ink filling mechanism is via converter and cartridge mechanism. It can also be used as eyedropper. 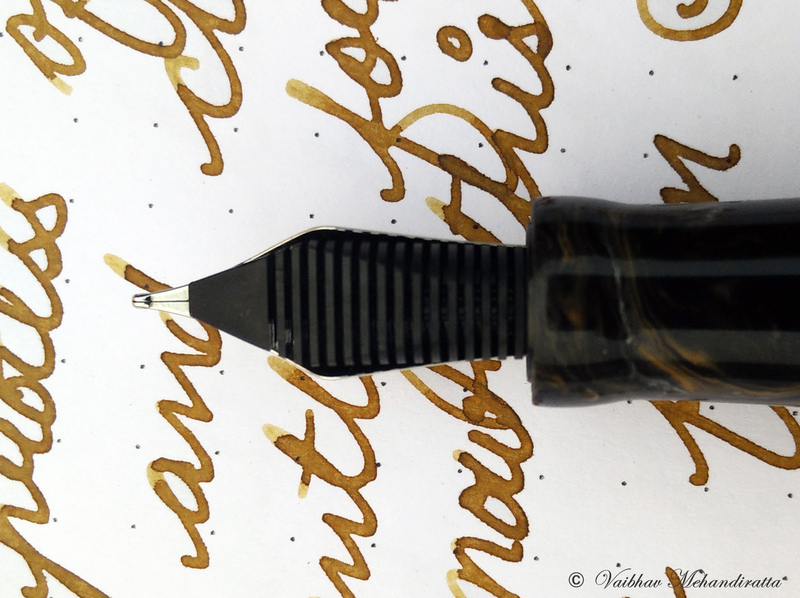 This pen writes beautifully and writes wet and is perfect for shading inks. 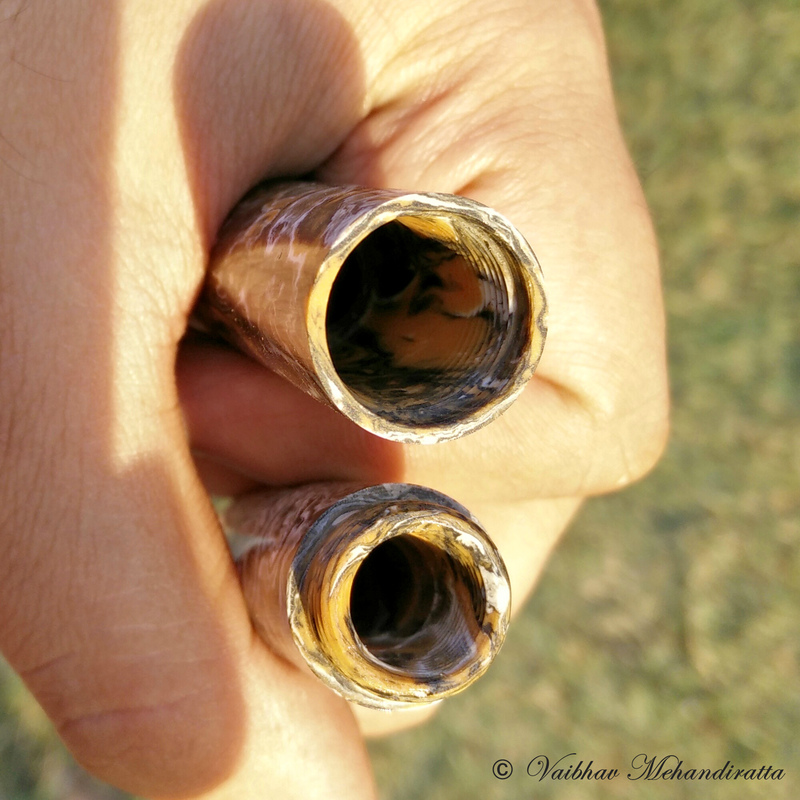 Below are the few images which shows the handwritten review along with test of wetness and line variation. 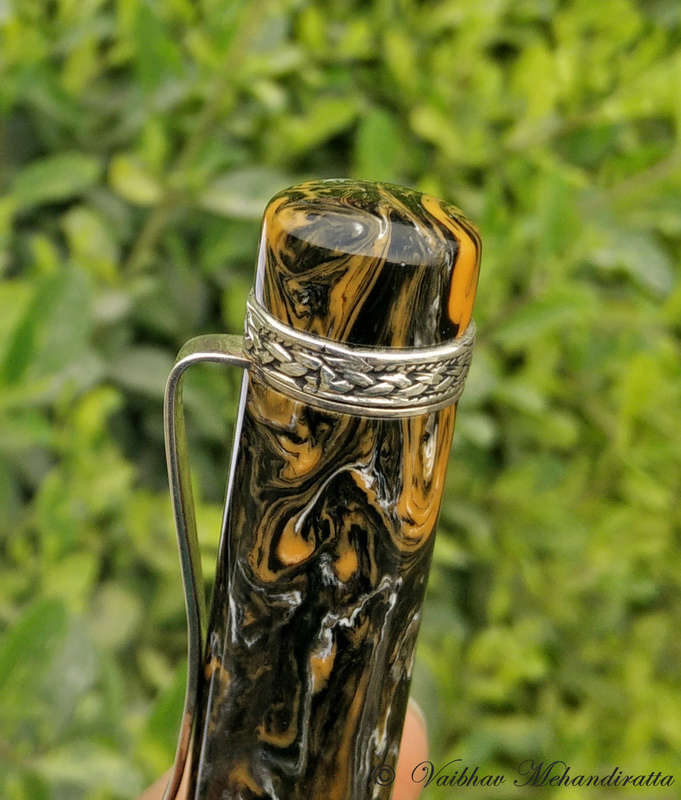 This pen is available starting from 70 USD. And is available in different materials like wood, ebonite, acrylic resin. It is my top favorite pen. No.1 in my top favorite followed closely by Ranga Model 4C. 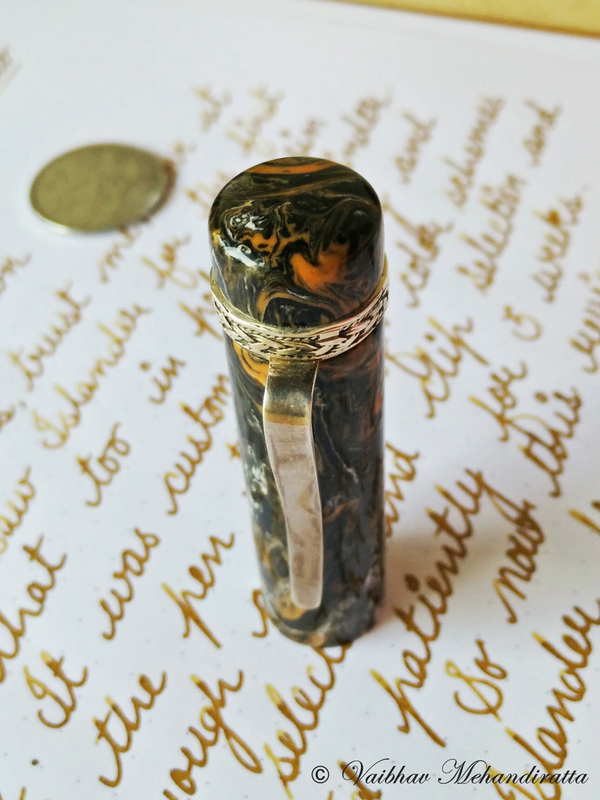 Just to tell you all that this is completely handmade pen. Kudos to Mr. Deshmukh. Thank you. Awesome work. I love your word for Wednesday and quotes for Tuesday. Keep up the great posts. 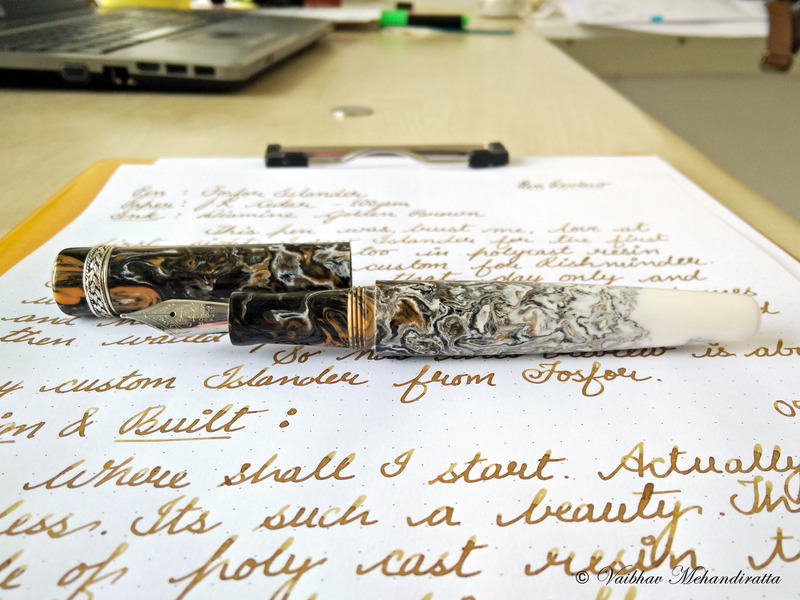 This review is awesome and very convincing that Manoj Deshmukh has made an excellent beauty of a pen. Thank you for bringing Manoj Deshmukh and Fosfor to the public consciousness. 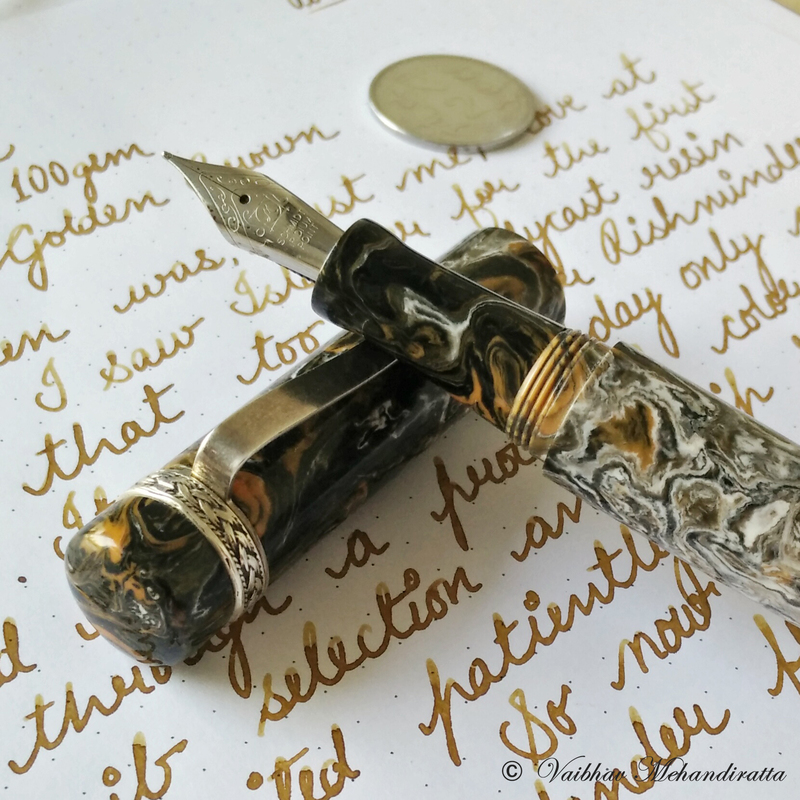 Lusting over pen! Better save up now. I was looking for inspiration to order a FP from Mr Deshmukh and your Islander is a great candidate! No doubt live at first sight!!! How can I get same pen?? And cost? what a sorrow assessment. As I designer, I would have wished to have a few people like you on my side. Clear specific comments. Hello Vaibhav! A very nice review + you have some nice photography skills. 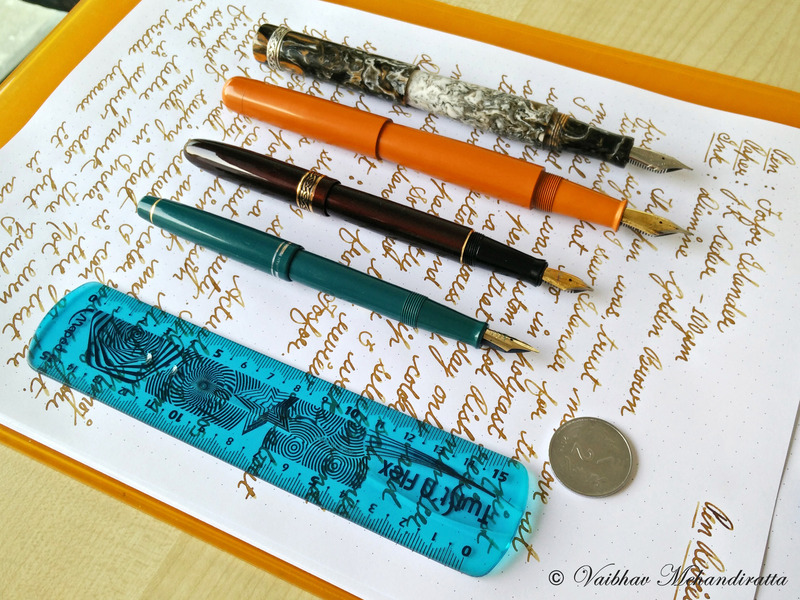 I wanted to ask you if Bril blue ink is better than Camlin blue ink? And is Camlin blue better than Parker Quink blue? I have used both Parker and Camlin, but I am new to this stuff so I don’t get the difference. 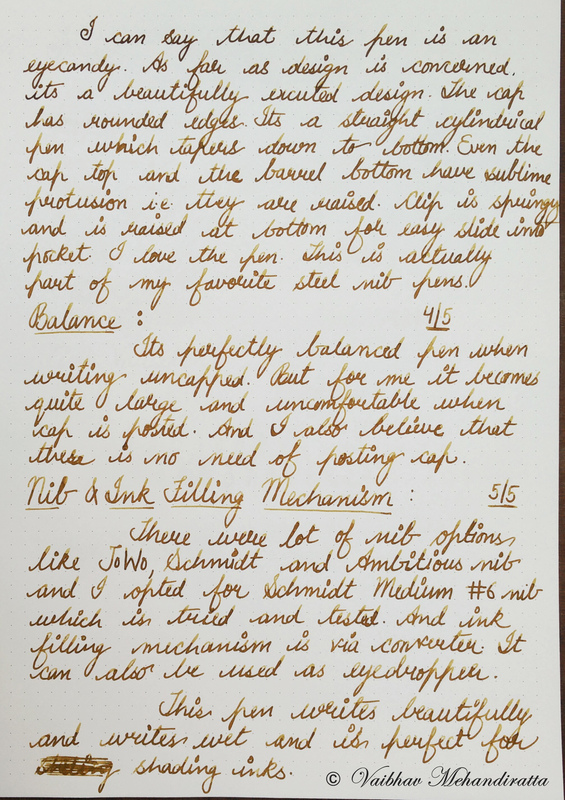 And can I remove the piston converter from my Baoer Eight Horses and use eyedropper to fill ink in the barrel? Will it work that way? I also wanted to ask if Camlin inks lasts for years in books/papers? 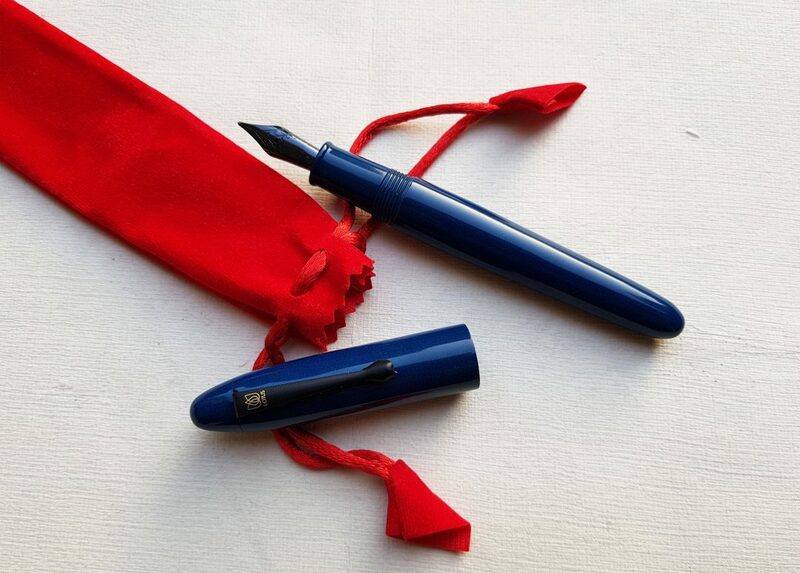 And one last question, what’s so special about Lamy ink that it’s sold for ₹400? Ahhh! Thanks for explaining. 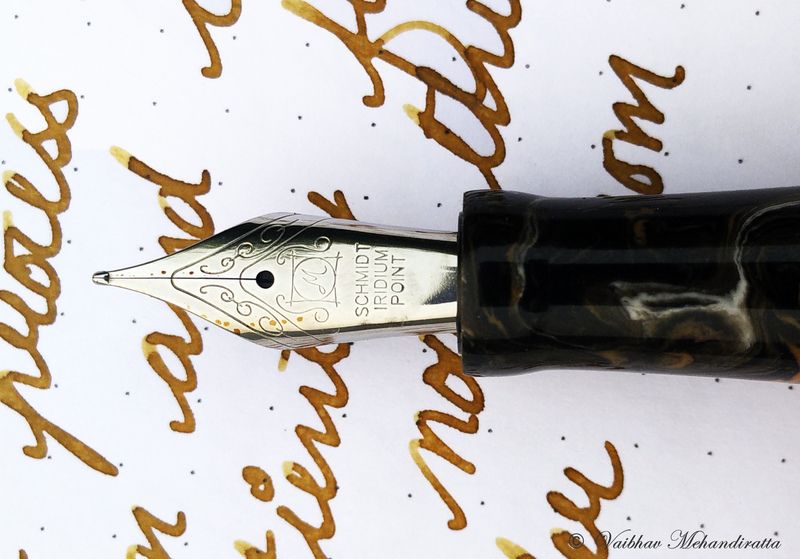 Do you know any website that explains fountain pens in detail like nibs (medium, fine, extra-fine) and wet nib, swabs, etc and some good tips & information (like the one you said about keeping written notes in dark so it lasts longer) about fountain pens? 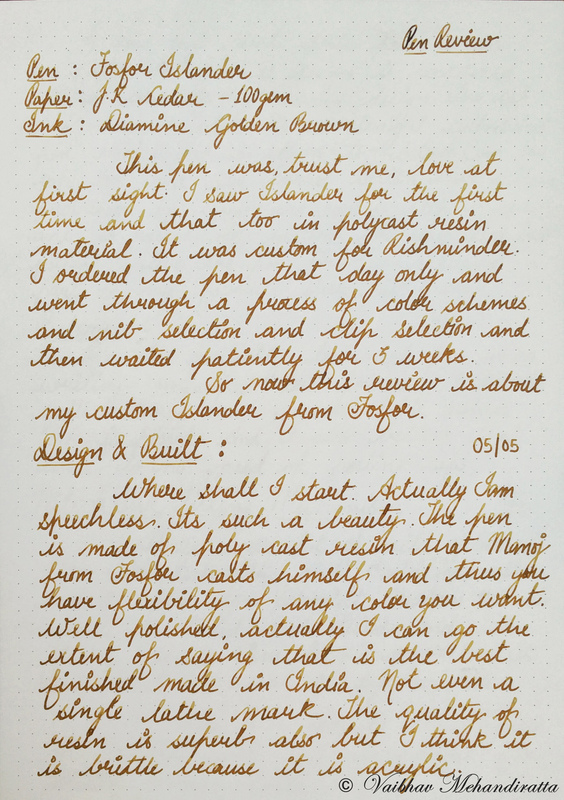 By the way which (brown/yellow) ink brand did you use in this review? 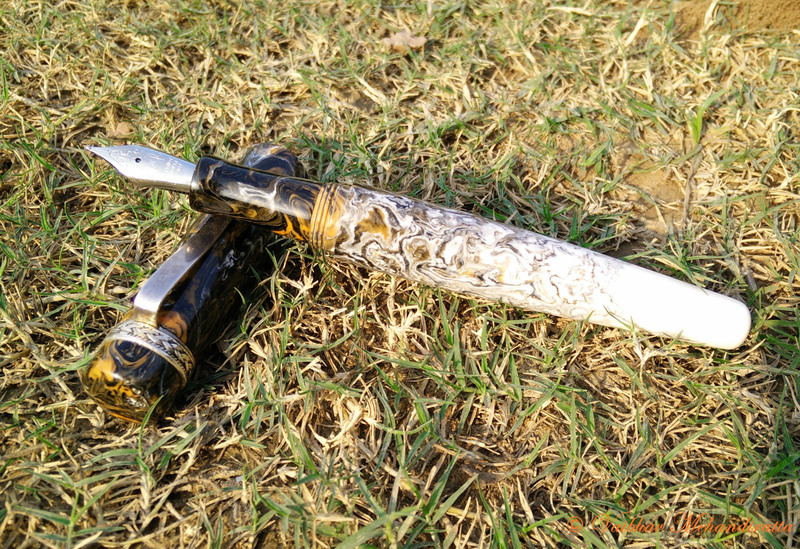 I accidentally stumbled upon your blog searching for Indian made Fountain pens. It has been an amazing day today going through your reviews.. 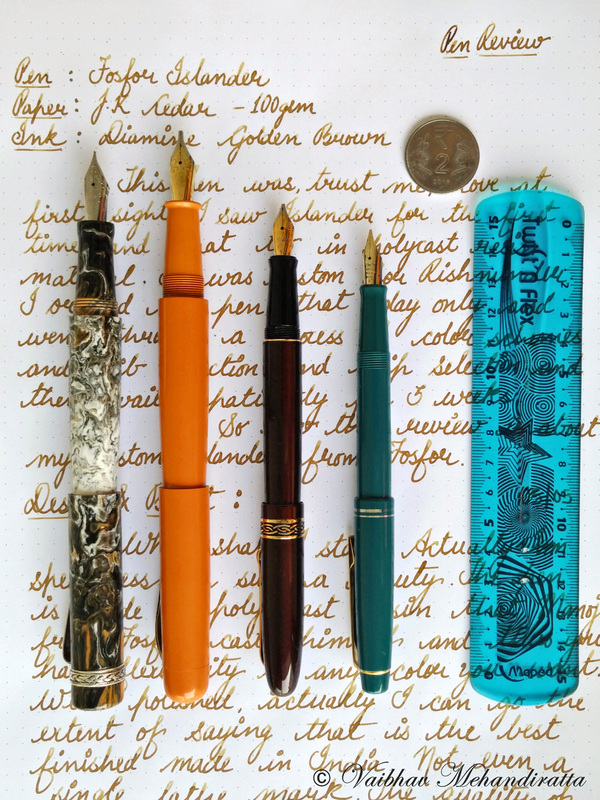 I have been a regular user of fountain pens for the past 12 years. Have got into collecting new pens only recently and your blog has fuelled the need for me to buy more pens! Thanks for the wonderful job!. 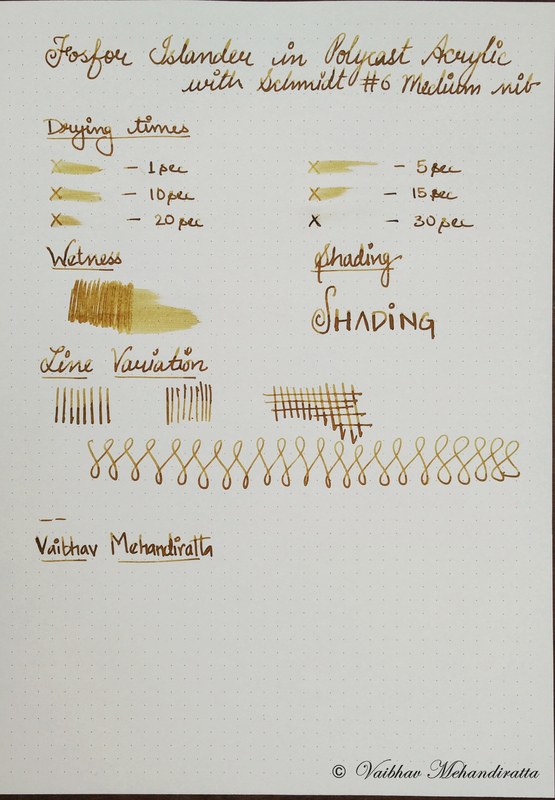 By the way can you find Noodler’s Inks for purchase in Delhi? Excellent review, fabulous pictures, and I love the new tagline on your pics. 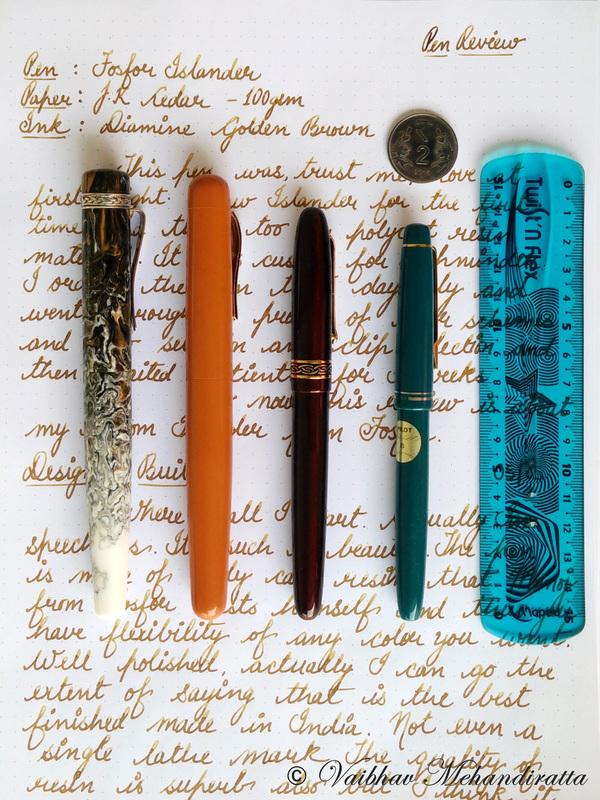 The pens you review are not common, and your reviews improve with each one I read. Thank you! 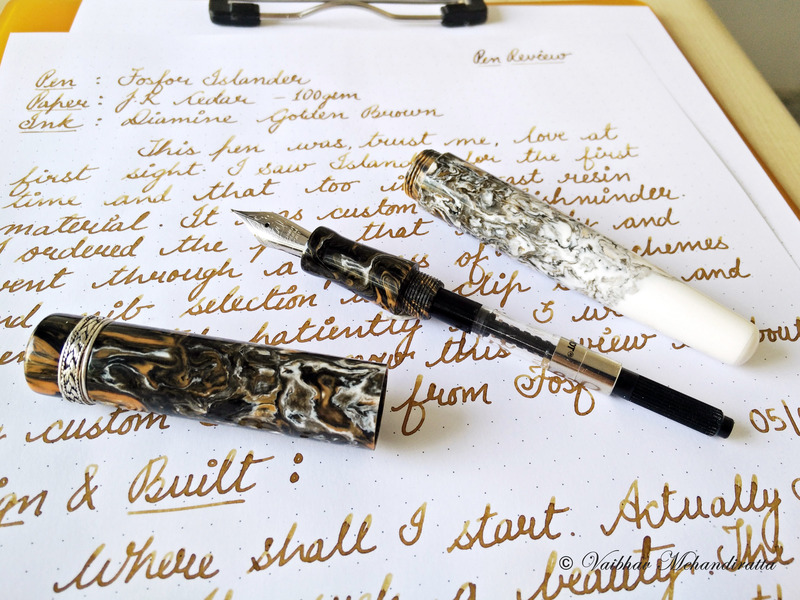 Beautiful review of a seriously beautiful pen.